"Inspire sweet dreams with a cozy queen platform bed. 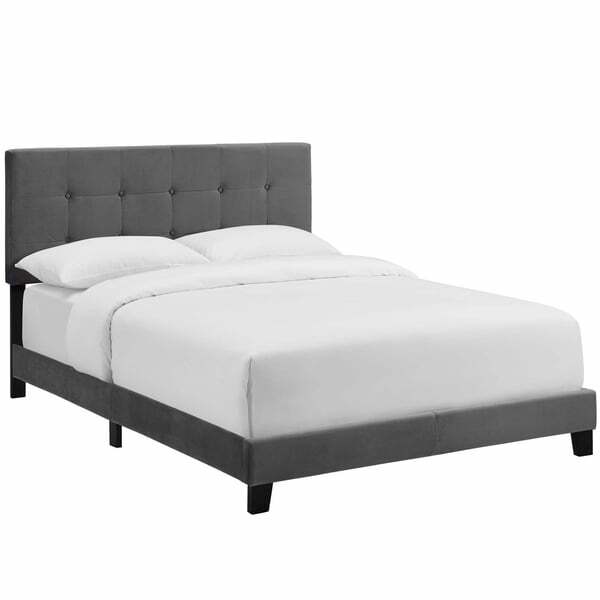 Designed with chic elegance and contemporary style, Amira comes with a stain-resistant velvet fabric upholstered base, timeless button-tufted headboard, and wood bed frame and legs, with non-marking foot caps. Complete with a reinforced center beam for maximum stability, Amira accommodates memory foam, spring, latex, and hybrid mattresses. A sleek and sophisticated centerpiece to the master bedroom or guest suite, this modern bed effortlessly transforms your bedroom decor with its luxe look. Box spring required (not included). Bed Weight Capacity: 800 lbs. Materials: MDF BOARD 20kg/m3 density foam LVL TOPICAL WOOD LVB/RUBBERWOOD MDF BOARD 4pcs adjustable support legs. Dimensions 84.5 In. X 64.5 In. X 45.5 In. The bed is nice enough, but it did not come with assembly instructions. Unfortunately, Overstock was unable to provide hem either. I guessed from the pictures and had a few washers left over but it seems sturdy enough. Perfect love the feel went perfect with my theme! !